They have selected their next production “Elixir d’Amore”, the story of a man with a magic potion and it will be performed in June and Rosalinda Perez, members of the Perez family and the Hudson Lyric Opera Company will again bring to the area a classic opera piece. Rosalinda Perez, who plays piano and sometimes directs the orchestra that backs up the many talented Hudson Valley region operatic performers was born to music. Her mother was a soprano and her father, a tenor and both performed in their Opera Caravan company in New York. Rosalinda, from early age on, would hear opera music from morn to night from her parents and students at a New York City college where they lived and her father worked. So it was natural that Rosalinda who moved to Garnerville in the early 70s to have her daughter and two sons follow in the families pattern and become singers and performers. Louise Solomon, her daughter and Andre and Nicholas Perez and a granddaughter all perform in the Hudson Lyric Operas productions. 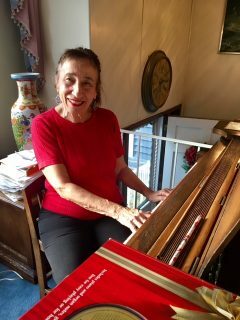 Rosalinda has been performing for decades, a church organist at St. Gregory Barbarigo Roman Catholic Church, Thiells United Methodist Church in Thiells and still at Trinity United Methodist Church in Stony Point, where Hudson Lyric performs its operatic shows. Hudson Lyric is now auditioning for the new performance and continues to seek new members who donate $100 each to the opera company which also raises funds by ticket sales and membership dues, all tax deductable. Contact hudsonlyricoperacompany.org.